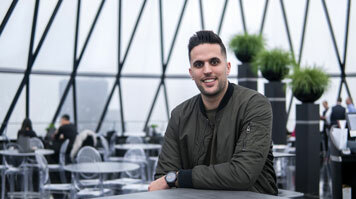 An alumnus of LSBU’s School of Arts and Creative Industries, Aaron Branch was awarded a place on the Graduate Entrepreneur Scheme for 2017/18. With his background as a semi-professional basketball player, Aaron seamlessly transferred the skills that made him a successful athlete to become an entrepreneur. Aaron says that the highlights so far have been the support he has received from both his mentors and the people running the programme. “Having started my business on my own I found it very rare that anyone other than a client, prospect or employee would take such a keen interest in my own and the company’s success. It feels great to have individuals there who are objectively looking at your business and how they can assist in its growth. Social Agendas was formed in January 2015 as an advertising agency focused on lead generation through social media adverts. In order to achieve cost-effective and highly qualified leads for their clients, Social Agendas delivers marketing strategy and development, Facebook advertising campaigns, landing page strategy and development, media production, email marketing and messenger marketing. Read more about Social Agendas on their website.